Product developer Martin Gremlica is in charge of the new X1 smart home server at Gira. At BAU 2017 Gira will be exhibiting a new smart home server: the X1, which was developed to be compact and affordable and is aimed particularly at smaller properties like detached (single-family) homes. We talked to its developer Martin Gremlica about the trend towards simplification of smart home technology, questions of data and home security and the challenge of installing a WLAN-compatible kettle in a smart home. Florian Heilmeyer: Mr. Gremlica, BAU 2017 begins next week, and Gira will be presenting the new X1 server there for the first time. At the same time, hasn’t Gira long been offering an “intelligent control center” for smart homes and smart offices with the HomeServer? 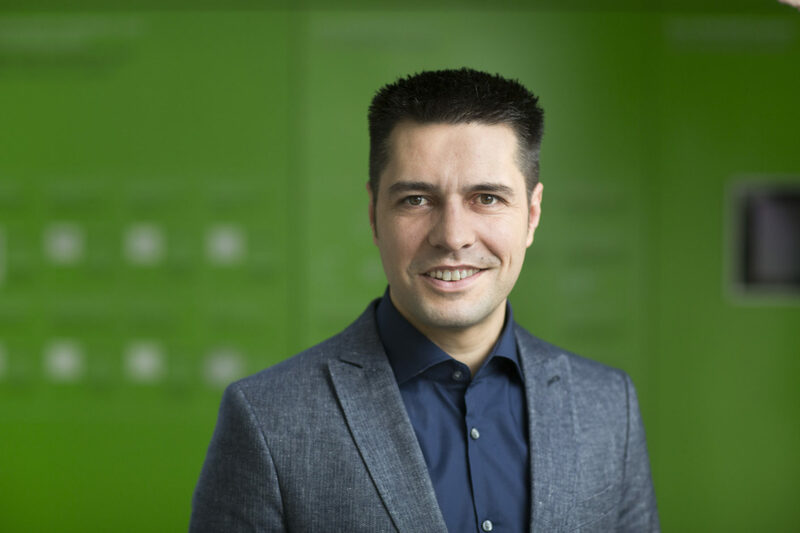 Martin Gremlica: At Gira we spent much more time on the development of a small, compact and simple system server because our HomeServer has been well received on the market for some years now but is designed primarily for more demanding solutions. The HomeServer is basically more suitable for villas comprising several buildings or industrial solutions, i.e., big offices and factories. It is here that its many capabilities in the areas of logic, connection and QC or free visualization can best be utilized. The HomeServer was correspondingly very well received for larger properties because here the number of objects, products and hence the number of applications that have to be controlled and brought into harmony with one another is a lot higher. 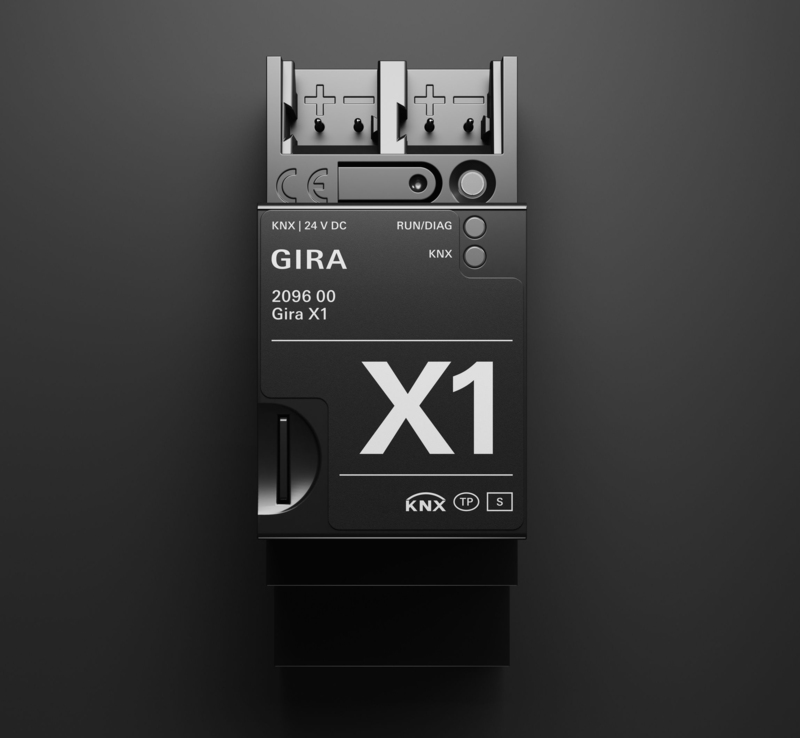 As small as three fuses and just as simple to install: the new Gira X1. 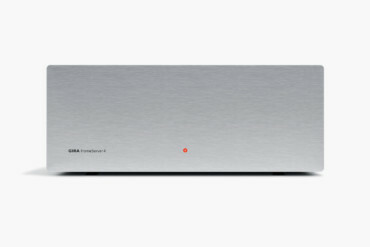 Could one say therefore that the X1 is a pared-down version of the HomeServer? Martin Gremlica: One could say that, yet at the same time it wouldn’t go far enough. 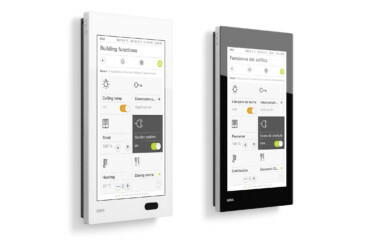 They are two different products that we have developed for different areas of application in this very complex field of smart building controls. The HomeServer is large and complex, hence it is more expensive and challenging to install – but there are also virtually endless possibilities for incorporating devices and programming functions and combining these with scenarios in the buildings. The other solution, the X1, is smaller, more compact and more accessible. The most important difference between the two is the target group. With the X1 we are primarily aiming at people who own detached family homes, be they renovations of old buildings or installations in new ones. 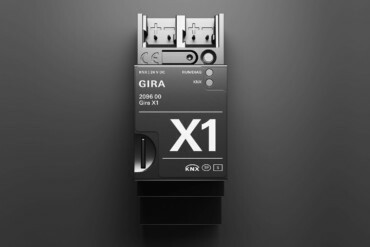 With its installation range however, the X1 is now also being aimed particularly at electricians and fitters, i.e., those who specialize in planning electrics for smaller properties. Our HomeServer has always been rather too complex and costly for them, so they generally haven’t recommended it to their customers. That’s why we struggled to gain a foothold in the area of detached family homes with our HomeServer and it was this insight that led us to develop the X1. What should I expect if I as a homeowner am not yet very familiar with smart homes and I purchase an X1 through my expert electrician? Does it come ready with various functions that I then just need to activate? Martin Gremlica: In our experience every client and every object is different. In keeping with this the X1 is supplied with a few readymade functions with which a smart home can be configured relatively easily. This might be controlling blinds, for example, heating and ventilation, doors, windows and cameras, and the lighting can also be controlled or composed into individual lighting scenarios. With the 35 logic building blocks, it is then possible to implement comprehensive scenes and time switch routines as well as logic functions. Then, for example, other scenarios are triggered for each family member as they enter the home. 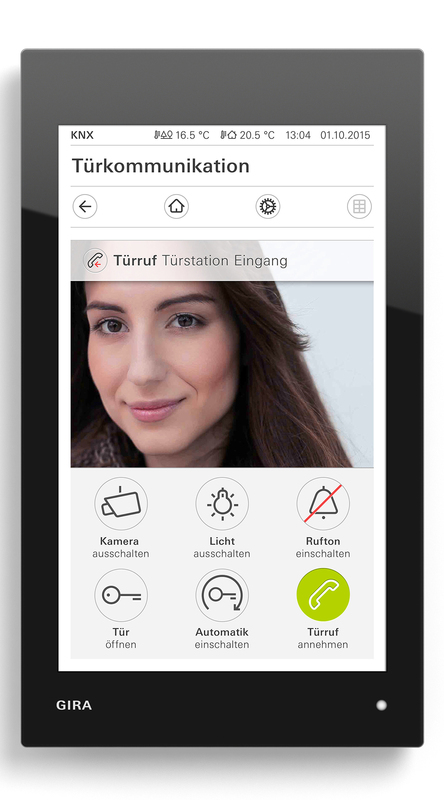 Communication will all appliances and applications is handled by the purpose-developed X1 App – using either a Smartphone or a tablet PC. How does it work if I want to connect up devices from different manufacturers? Martin Gremlica: The KNX standard has been in place for over 20 years and is now offered by a great many manufacturers. As long as the devices are compatible with this standard then our server can also incorporate them into the smart home and control them. The HomeServer or X1 would control the new device with the functions offered by the manufacturer and would be able to integrate it comprehensively into all the logic routines of the relevant home. Thus the system is more independent of individual manufacturers and thus stronger. This means, for example, that owners of smart homes are protected from company bankruptcies. 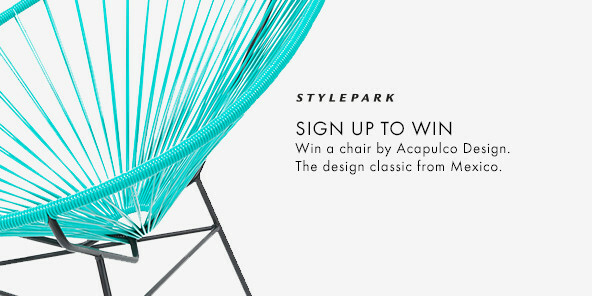 Just imagine that you’ve always relied entirely on one manufacturer and the next day it goes bankrupt. 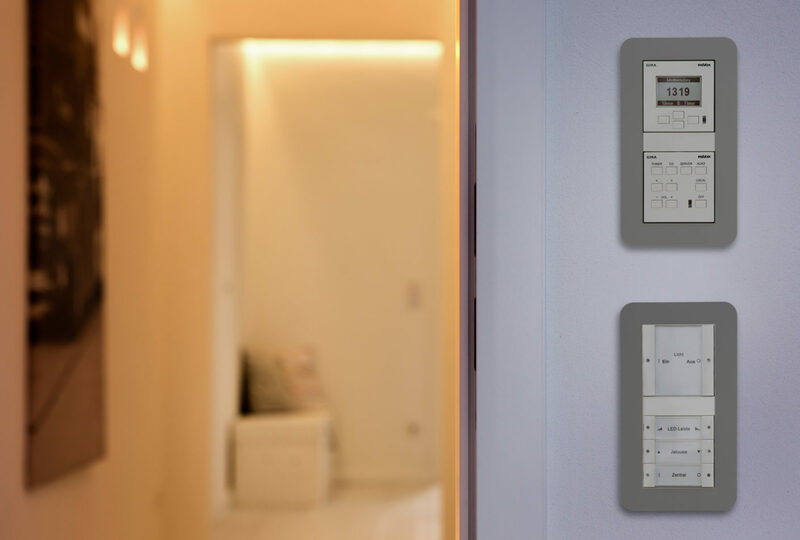 In the KNX standard each device can be replaced because there are several manufacturers. Do you know Mark Rittman from the UK? Martin Gremlica: No, I don’t think so. Rittman is an expert and a consultant on data security, as well as a technology blogger who is well known in the UK. A few months ago he achieved a certain level of international fame when he reported live via Twitter as he spent eleven hours attempting to connect his new WLAN-compatible kettle to his smart home. Over dinner the entire family suddenly found itself in the dark because the smart lights had to perform a firmware update after the installation of the kettle. You laugh, but it’s pretty awful actually. Jacques Tati presented stories like this as a comedy involving a high-tech house back in 1958 with “Mon Oncle”. Martin Gremlica: Of course. There are a lot of stories like that about the smart home. There is also broad skepticism regarding the technological upgrading of one’s own four walls. I can only say that I personally am not so skeptical, otherwise I wouldn’t recommend or develop these solutions. For me the smart home represents a remarkable increase in home comfort thanks to all the new possibilities that controlling my home from inside and outside offers. I can program a huge variety of moods and atmospheres, I can turn on the heating before I get home and I can transfer simple tasks like ventilation, heating or watering plants to my house. Then I get home to a warm, cozy house that saves me time and effort. But perhaps the most important aspect is the safety! Imagine the smoke alarm goes off and the house makes sure that all the escape routes are promptly illuminated, all roller blinds rolled up and the doors are unlocked in time. The additional activation of smart home functions using wall switches and sensors enhances comfort of use. Should you not be able to find your mobile phone, for example. One personal question: How smart is your own house, Mr. Gremlica? Martin Gremlica: How should I put this? I am a self-confessed nerd in this area. It wasn’t that long ago that I was involved in construction myself. I am a trained electrical engineer and during my studies I occasionally worked in construction, so I was able to build quite a lot myself with my father. I put in the electrics entirely by myself, which included pretty much all the devices and applications from the Gira program from the HomeServer through to the X1. This wasn’t always in the usual market combinations that would be recommended to a normal client, however. So what I’m imagining now is a slightly Jacques Tati-esque house. Martin Gremlica: Yes, you can easily have a crazy image in your mind. Most of the components I have can be controlled, from the solar modules to the heating and the ventilation. The weather station on the roof gives me a warning when rain is coming and the skylights are open. I built and programmed the boiler stove myself. I think there was just about everything you can imagine in terms of playing around with electrics. For me the home is an endless experiment that I will continue to tinker with over the long term. In all seriousness though, it is the basis for my work in product development. Thus I know precisely from my own experience what I’m talking about, and can see for myself what works well and what doesn’t. In line with this, I always enjoy being involved in the field tests we carry out at Gira. 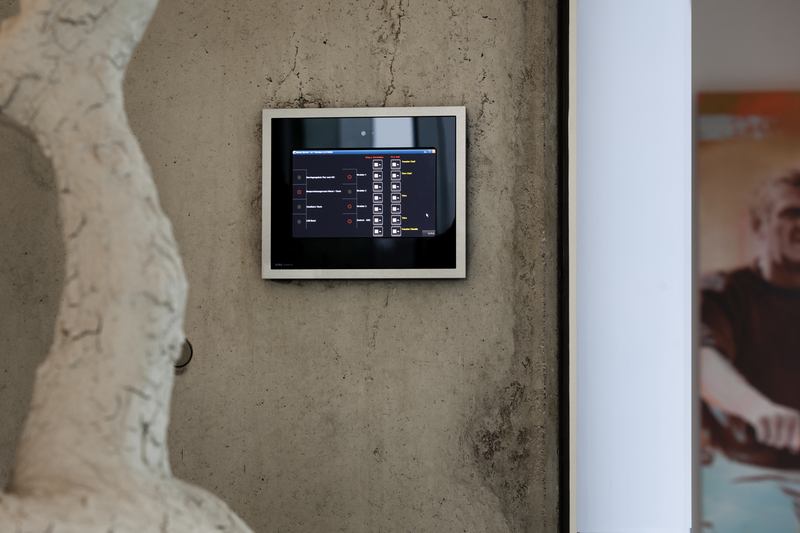 The smart home or smart office is controlled centrally via Touchscreens, for example using the Gira Control Client. OK, but you yourself are also an electrical engineer and clearly you’re something of a Gyro Gearloose in the field of smart homes. What advice would you give a friend who is not so knowledgeable in this area, but who is contemplating a few or some of the functions of a smart home? Martin Gremlica: That depends. For new builds I would advise equipping all rooms with KNX connections. You can imagine this like a green telephone cable that is laid in every room. This cabling is relatively cheap and opens up all sorts of possibilities for subsequent smart elements in the home. You can then start small with just one room or one logic routine and take your time to see how you like it. You can also equip houses with radio systems, but that is often more difficult. Whether the devices are easily accessible or where you can set them up depends on the wall thicknesses and materials. So I would primarily recommend radio systems for the upgrading of properties in which you don’t want to open up any walls to lay new wires. 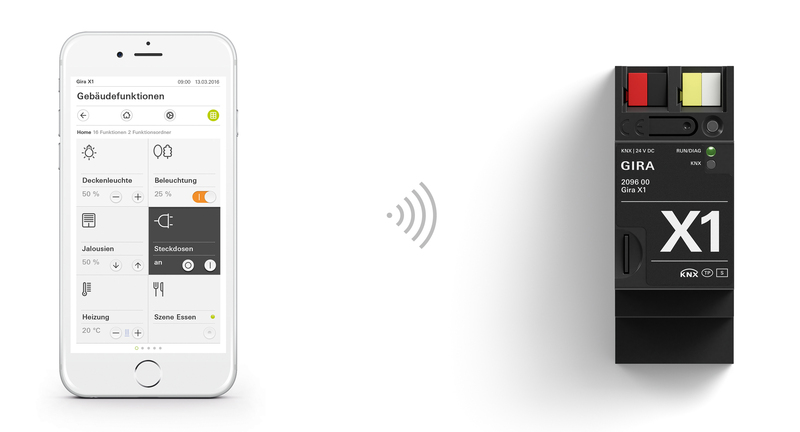 With the KNX radio system it’s possible to have a combination of wire and radio devices. 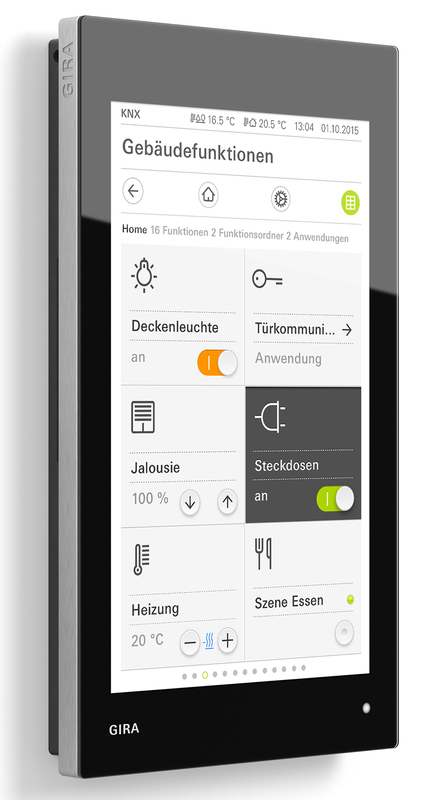 Gira itself offers a variety of tactile sensors, but why would I actually need them if I can control my home via smartphone or tablet anyway? Martin Gremlica: In theory a smart home doesn’t actually need wall-mounted switches anymore, but it’s a question of attitude: Am I really doing the right thing not having any more switches in the house? 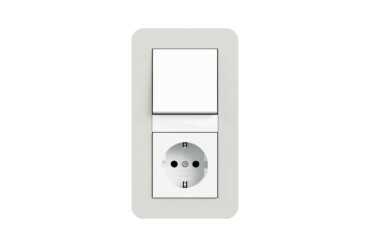 For several decades now people have been used to finding a switch by the door in every room. In addition people tend to put their phones down and not find them again. ...and then I’ve lost my house controls too. Martin Gremlica: Exactly. You have to decide for yourself of course, but I would find it difficult to no longer have switches in the house – and my wife would probably kick me out. What I find more appropriate are the combined systems where I can control the entire house via my smartphone, but I also have additional wall-mounted switches in the home. That’s the most sensible and convenient solution as far as I’m concerned. A second main reason for many people’s skepticism about smart homes is clearly security, and by that I mean both data security and physical security. If the data on our smart homes are accessible, then the music system might suddenly start to play adverts and the fridge might only order products from one particular firm. Some intruders might even become “smart burglars.” So how important is the subject of security in product development at Gira? Martin Gremlica: Extremely important. It’s been a massive issue with us even long before the SZ research. Quite some time ago and entirely of our own initiative, we looked into how easily HomeServers active in the network could be traced. Actually a great many of these systems were accessible. Why is that? Because on the factory side we had equipped the servers with far too easy, standard passwords and we hadn’t been clear enough to the KNX processors about changing and personalizing them during the installation. It’s always a balancing act: On the one hand it mustn’t be too complicated for the user, and on the other security must be guaranteed. In the meantime we’ve improved a great deal, however. Readily comprehensive layout of building functions on the wall switches or a palm-held. More safety: door communications can also be controlled when you’re not at home. How did you resolve that with the X1? Martin Gremlica: The X1 now has a very long password specific to the device. That is printed on the device, just like you can see on telephone routers, for example. In addition, we equipped the X1 with a VPN in order to make the external controlling and the data exchange with all the user’s mobile devices as secure as possible. All the communication is now TLS-encrypted, which is now used as standard in online banking. It’s currently one of the most secure systems around. If we now take a look ahead, what do you think will be the most important trends in the area of smart homes in 2017? Martin Gremlica: Undoubtedly we will continue to tackle these two important pillars: comfort and security. Of these, at the moment it seems to me that security is the most important topic for the customer, as that’s what we get most questions about. In 2017 we’re going to be developing a few more application possibilities for the X1, for example for various simulations of presence in the home. Thus, whilst I’m on holiday, the house might open up the blinds, open the windows, and perhaps even turn on the lights, the TV and some music. The police are now also in favor of such scenarios, since statistically illuminated and/or lived-in properties are simply far less likely to be broken into. Yet we don’t want to lose sight of comfort and enjoyment here. There are ever more devices and applications in this area and we need to ensure that these can be installed and synchronized as easily as possible. This way it might even be possible, for example, to install a smart kettle problem-free. After all, one thing is certain: Smart homes need to be fun.